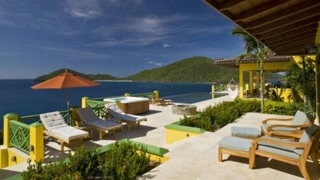 Luxury Portfolio International is proud to present this Golden Pavilion in Tortola, British Virgin Islands. This waterfront gem set on 4.5 acres is only a short walk from secluded Little Bay beach. This over 6000 sq. ft. Balinese-inspired villa has 4 reception rooms, 4 bedrooms and 4.5 baths in the main plus a one bedroom guest cottage. Traditional Balinese elements go in hand with a refined British colonial flair. Even the chef-ready kitchen enjoys breathtaking views. You simply must experience this private world where a soothing and comfortable ambiance combines with the highest fits and finishes. Enjoy 180 degree ocean views from the dramatic terrace with heated infinity edge pool, hot tub, and outdoor fire grill. This property is listed by Smiths Gore Limited, a member of Luxury Portfolio International.